10 athletes so everyone has full access to the coach. February thru June 19th 2011, we will train athletes and beginners to complete their first triathlon or step up to the Olympic distance race. The course will culminate with a competition in the HFP Racing Maumee Bay Triathlon. Learn all the techniques for the sport of triathlon. Personal coaching with three group training sessions per week led by Coach Tim. A training plan will be set up for each athlete so that you will be ready to enjoy the sport of triathlon! Contact Info@NCEcoaching.com for details and registration information. One Full day Clinic with Road Cycling instruction & workouts. The course will cover climbing, descending, cornering, sprinting, pack riding, aerodynamics, race tactics, and much more. Class is limited to 8 athletes so everyone has full access to the coach. $100 per person, includes road lunch, dinner, and all instruction / training for the day. One Full day Clinic with Swim, Mountain Bike, & Trail running instruction & workouts. The course will cover open water swimming technique and tactics, mountain bike techniques, and trail running. Class is limited to 8 athletes so everyone has full access to the coach. $100 per person, includes trail lunch, dinner, and all instruction / training for the day. One Full day Clinic with Open Water Swimming, Cycling, Running, and Transition instruction & workouts. Class is limited to 12 athletes so everyone has full access to the coach. At least 2 athletes are needed to hold a clinic. Athletes need wetsuits, road bike, helmet, running shoes, & appropriate clothing. $100 per person, includes lunch and all instruction / training for the day. Contact Info@NCEcoaching.com for details. Register below! One Full day Clinic with Mountain Bike instruction & workouts. The course will cover climbing, descending, cornering, sprinting, technical skills, race tactics, and much more. Class is limited to 8 athletes so everyone has full access to the coach. Two great dates to choose from! September 10th 2011 Venue to be determined. Half day Clinic focusing on skills for cyclocross racing and riding. 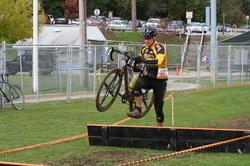 The course will cover barrier running, dismounts, carries, remounts, cornering, tactics, and much more. Class is limited to 8 athletes so everyone has full access to the coaches. $50 per person, includes all instruction for the day and snacks.